How do YOU say it?? I want to see which one is more popular. haha! Well.....to get your southern version of the saying....click the pic below. See??? Even Nikki says it the way "we" do...haha!! I say you get what you get and you don't pitch a fit. I've been saying the don't get upset as properly as possible and I still can't make it work. I guess my southern accent keeps getting in the way. Love the poster. Well, here in SC, get does NOT rhyme in any way, shape, or form with upset. So, in my classroom, we don't throw a fit. Love the poster! I live where you live and I've never heard of get and fit rhyming. It's always been "You get what you get and don't get upset." But, I do love that poster. Unfortunately, when I click on it, it says not found. Wahhhhh! Thanks for sharing, though! Well, in South Carolina...it's get and fit, y'all. I have always used the get and fit sentence and I'm from Kansas. Definitely fit but now I say You get what you get and you appreciate it! I love this saying!! I use it with my students & my daughter all of the time. :) Thank you!! Miss Nelson, I'm definitely using your version now. I like to teach appreciation (even for things you don't necessarily like). I say this all the time!!!! I love your poster :) Is it available somewhere to get? I totally want it! haha. I tried clicking on it but it didn't take me anywhere. Ooooooh I love Miss Nelson's version best! I am a California girl and I say it like Erica. I am switching to the new version from Miss Nelson come fall. I love it! I have always heard it this way! You get what you get and you don't throw a fit! I say it you get what you get and don't throw a fit. I am confused how get rhymes with upset??? I started with the don't throw a fit. Then I heard don't get upset. Now I kind of like the positive spin - you appreciate it. I moved from NY to Colorado 4 years ago and the Kinder teacher at my school said get and fit. I just liked the saying and started using it. I never thought get and fit really rhymed but the whole saying seemed to flow very nicely none the less and I say it all the time. I would have to agree with Erica though that for me get and upset are the rhymers but I will still stick to the "southern" version because it's the one I've always used. I do like Miss Nelson's version though too -- positive talk! I say this as well, but I can't get the poster to download either. Haha! I'm in Chicago, definitely not the south... but "get" and "fit" rhyme here, too. And speaking of teaching phonics - little story. When I was teaching the /wh/ sound, my reading program wanted me to teach that it sounds like /hw/... like h-why and h-where, if that makes sense... maybe somewhere in the US someone says the H sound first but we definitely don't! I am from MI, but live in GA. So I say throw a fit too. I like Miss Nelson's version with I appreciate it too. In my room I said it once and for the rest of the year the kids were finishing my sentence due to the rhyming: "You get what you get and you don't get upset." In Miami (though very south) we don't have lovely accents and drawls (though I <3 them). Love the picture!! And yes even in Michigan (and I have lived here my whole life) get and fit rhyme. I say "You got what you git and you don't throw a fit!" (phonetically). "You get what you get and you don't throw a fit!" I love your sign, but sadly it won't let me download it. I LOVE this saying! In Virginia, or at least in Central VA, we say "You get what you get...." and the kids always finish, "and you don't throw a fit!" Makes life easier! I think the K teachers start it (maybe PreK for some)....and trust me, the rest of us use it as the years go by! 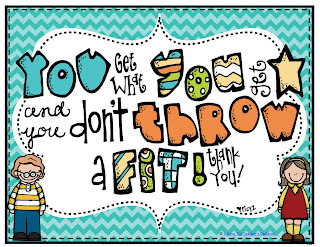 i have always used "don't throw a fit" but this year saw Donna Glynn's "appreciate it" poster and loved! I'm using it this year. Either way get/fit or get/it rhyme in Mississippi! My kiddos would pretend to be British if we said get/upset. I might, too! Oh wow-- I'm really in the minority here! :) I've talked about this too. My class goes for an onomonopia -"You get what you get, and be glad what you got" BUT the grammar gives my heebee geebees as much as fit and get NOT rhyming. I've only heard that saying with "get" (pronounced git) and "fit". Since I'm from Texas, I can't seem to make "get" rhyme with "upset", though I know it should! BUT, I love Miss Nelson's positive spin the BEST! Haha! It rhymes in Missouri! :) Cute poster! That's so funny! I never thought about "get" and "fit" not rhyming...it definitely rhymes in Texas! You're right...poor kids, how confusing! Thanks for the poster! I think the "don't get upset" comes from Pinkalicious. I am pretty sure that's what it says in the book. Love the poster! Get and Fit rhyme in this house probably every other house in town! I am from South Florida and I say "You get what you get and you don't get upset." I don't see it as rhyming so much as having a melody to it. This is such a funny topic! I'm from New Hampshire where set and upset do rhyme so that's the saying we use. I think my favorite would be, "you get what you get and you don't pitch a fit.". That would SO have my kids confused as most of them don't know what a fit is and when we think of pitching up here in the north, it's all about baseball (Go Sox) lol. I think it is so stinkin' though! I say "you don't throw a FIT" but it does NOT rhyme LOL....short e and short i are two different sounds! I wish I could convert to "pitch a fit" ... but the other is too set in my head. Yep, you're right!! (the way you say it) I couldn't bring up the poster, though. Can you help? It doesn't work to click on it. Thanks. ahh!!! I'm so sorry guys...it should be fixed now!! But I am LOVING all your comments one what you use!!! These are so much fun to read!! Im a southern girl and we say you get what you get and you don't throw a fit :-) It rhymes because we say "git" instead of get lol I love our southern accents!! In Mississippi we say, "You 'git' what you 'git', and you don't throw a fit." So it does rhyme with our accent. We have to really stress those phonics when we are teaching them correctly. I'm from the South and get and fit totally rhyme! Get definitely rhymes with fit here in SW MO. I think several of my kiddos even spell get, "git". Thank you for the freebie, it is so cute!